← A long, cold, snowy week. The Weekend of Public Opinion. Went to the protests on Saturday. 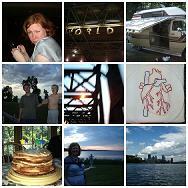 I took lots of pictures, but I wonâ€™t put them up yet b/c theyâ€™re old school film style pictures. Iâ€™ll have to get them developed, first. The police were pretty cool until they realized that they were going to have to get in our way, and then they really divided the marchers up into little groups and dispersed us. They marched a police line down Third Avenue with their clubs held out in front of them to clear out the street, and then where people weren’t moving they stampeded the horses at crowds, and started arresting people. They wouldn’t let us go to First Avenue at all – I heard it was blocked from 42nd to 96th, and I believe it because when we got home we heard that the police had to officially shut it down up to 72nd. So thatâ€™s the anti-war protests. It was fantastic. And while Iâ€™m mentioning war, why is it that when the country JOINS NYC on orange alert suddenly we have more â€˜protectionâ€™ in the streets? If weâ€™ve been at orange this whole time, than either we donâ€™t get more people, or maybe we shouldnâ€™t be at orange in the first place. Someone said to me that this terror stuff is just to scare the pants off of us and keep us from paying attention to other, more important things. Like war, and being stripped of our constitutional rights to express ourselves and meet in protest.